DIY Valentine’s Gifts for Husband | 18 Ideas AND Most are under $5. Have you noticed that men are hard to shop for? This Valentine’s Day, why don’t you try making him something special with these fun DIY Valentine’s gifts for husband ideas. I’m sure he’ll appreciate the personal touch! 1. Do you have a guy who likes to play games? How about making this Lovopoly board game for him? It looks like a ton of fun! 2. Here’s a great gift to last all year! Make a date night jar. 3. Make a Memory Jar to collect your memories together. This is a great idea and much better than my current system of sticking them in my drawer. 4. If his love language is words, try this Words of Affirmation Jar. 5. This is such a cute idea! Make your hubby a Valentine’s Day countdown! 6. If he has a sweet tooth, this Candy Bar Bouquet will be just perfect! 7. Such a thoughtful gift, the open when letters will be just the right thing on those days he needs a pick me up! 8. Such a creative way to say I love you! Give this Sensual Valentine and tickle all of his senses! Ooh la la! 9. This I Love you Because Frame is the perfect gift to celebrate your love all year round! 10. Look how fun this is! Create a hallway of hearts saying all the reasons why you love your guy. 11. Make a date per month for a year! This will give you both something to look forward to and make the date planning easy! 12. Frame some hearts of where you met, were married and now live. A beautiful treasure to enjoy for years! 13. Make a library of love! Who else misses those cool library cards we used to fill out when checking out a book? 14. Does your husband like playing cards? If so, this deck of 52 reasons why I love you will be his favorite! 15. 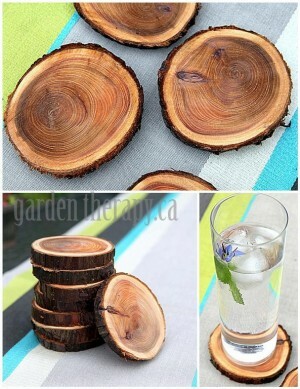 Make him a set of coasters from a fallen tree. He’ll always remember your thoughtfulness! 16. This masculine bouquet might just come in handy on laundry day when everything’s dirty! Ha! 17. Turn their old ties into Zip Pouches. Great place for their watch and cufflinks! 18. This Family Charging Station will help him become organized and keep everything charged when he needs it! Enjoy making a great gift for the man in your life with these DIY Valentine’s Gifts for Husband! Nice gifts ideas for husband on valentines day. I do have some valentine gifts ideas for husband. If you don’t mind can you check them out and let me know your valuable suggestions. This valentine is coming winter. So, any wife can give a winter T-shirt for his husband.